Whenever Rob and I go to the farmer’s market together, my husband will without fail wander off to buy cookies, taste-test random cheeses and strike up conversations with people just so that he can pet their dogs. Basically, he’s of no help when it comes to buying groceries for the week. Our most recent trip to the market was different though. When Roby was ready to leave he found me and proudly showed me his purchase: two zucchini and two yellow squash. No cookies. I was surprised and also, secretly pleased. Ok, maybe I wasn’t so secretive about it. If you don’t know what thoran is, let me explain. Thoran is a Keralite dish that’s made by mixing several ingredients together and then stir-frying it all into a tasty dish. You typically chop up vegetables or grate them and then mix them with grated coconut, curry leaves, serrano peppers, onion and spices. The ingredients and directions change slightly depending on what vegetable you’re cooking. I make my veggies this way fairly often because it’s easy and awesome. 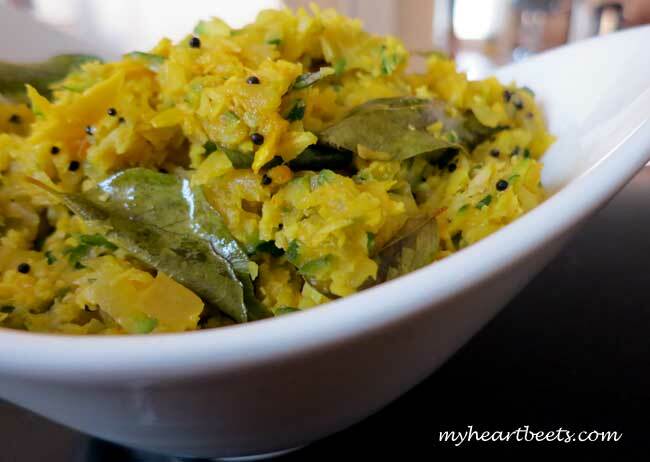 I was a teensy bit nervous about making this particular thoran because I had never had or made squash thoran before and I didn’t want to ruin the veggies that Roby had so thoughtfully picked out. Luckily, the squash rocked. If you’re looking for an interesting way to stir-fry squash, try out this flavorful dish. If you end up liking it, then check out my beet stir-fry, plantain stir-fry or cabbage stir-fry recipes. Trust me, you can’t go wrong with thoran. If you do hate it, which you won’t, then you can always dump it into spaghetti sauce (my solution for nearly everything). Enjoy myheartbeets-eaters! Melt the coconut oil in a skillet and add the mustard seeds. When the mustard seeds start to splutter, add the onion, serrano pepper, curry leaves, grated coconut and spices. Stir for a couple minutes and then add zucchini and stir-fry. Cook on low heat for about ten minutes while stirring occasionally. I’m so happy to have found your blog! (via Mark’s Daily Apple– I’m sure I’m not the only one!) 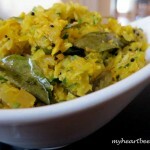 I love Indian food & have already spotted several dishes I MUST try! Awesome! I’m glad you found it too 🙂 Let me know what you think of any recipes you try! Ashley, thank you so much for this blog. I was worried I would deter from the plan because I will not be able to eat Indian food, but your blog shows a new way to cook all my favorite veggies. I now think, I might be able to stick to this diet plan. Do you use fresh or dry curry leaves? Hi Elena, I use fresh curry leaves. You can find them at any indian store or you can get them from Amazon: http://amzn.to/181aMNU I usually store the leaves I don’t use in my freezer. Hi, I absolutely love your blog! I have a question. I don’t have access to the frozen shredded coconut, is there any substitute? Possibly soaking shredded dried coconut? Thanks, Johnna! You can try adding the shredded dried coconut and see how that turns out – I’m sure it’ll be good. I probably wouldn’t soak it beforehand though. Let us know how it turns out for you. When do you add the serrano peppers and grated coconut?